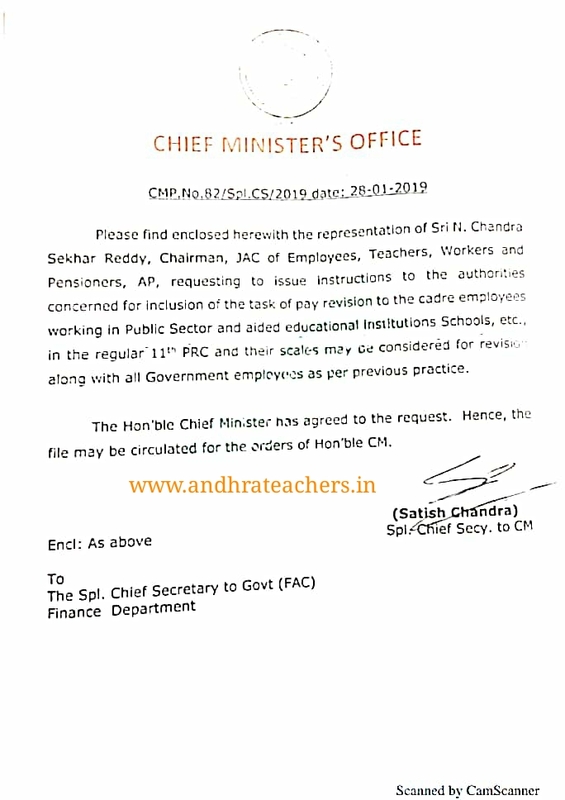 Please find enclosed herewith the representation of Sri N. ChandraSekhar Reddy, Chairman, JAC of Employees, Teachers workers and Pensioners, AP, requesting to issue instructions to the authoritiesconcerned for inclusion of the task of pay revision to the cadre employeesworking in Public Sector and aided educational ingituitions Schools, etc,in the regular 11 PRC and their scales mayoe consideréd for revisiona long with all Government employees as per previous practice. The Hon'ble Chief Minister has agreed to the request. Hence, thef file may be circulated for the orders of Hon'ble CM.